If you’re literally paying an expert stranger to listen to your problems, there’s no reason to be apologetic, but still. I want to defend my father to the patient woman sitting across from me, regarding me thoughtfully over the top of her legal pad. There’s no judgment coming from her placid scrutiny, but I’m airing secrets, so I feel guilty. The trauma (one of many) we’re working on is not the tongue in the mouth – which was just gross and confusing. It’s the schism between what I know happened and what I was later told. “Stop it That’s not true. We don’t say things like that about family!” I did say it, though. And I learned a lesson – just because a thing is real doesn’t mean you should say it or that you will be believed. I didn’t know the word gaslighting then, but even if I had, I’d have felt bad applying it to my parents who were only trying to protect me with what they had: a salve of love and denial. Also, they’re dead, and it feels disrespectful. It’s taken years to understand that I’m deeply and essentially angry that I was taught to distrust my own perceptions at an early age. And that most of my shame is about that anger. I’m supposed to list my traumas today, and I’m surprised at how embarrassing it is. They seem shabby and insubstantial. Beat-up cardboard traumas. Therapy is a show and tell of scars. Scar-gazing. This one, I got in preschool. This one, on the bus in middle school. This one, in my own house, when I was 19. Oh, yeah – I forgot the one when I was nine; it’s more like a soft-focus movie-memory, but we should probably count it. It’s almost illicit – the pleasure of speaking aloud what has always felt true in my bones and being not just heard but validated. The minute I leave this office, I will, of course, immediately begin spackling over this bright relief with a layer of guilt and dissociation. But each time, the layer is thinner and easier to bust through. Eventually, maybe I’ll get tired of cleaning up the mess and just not bother with the covering over. But for now, this is okay. 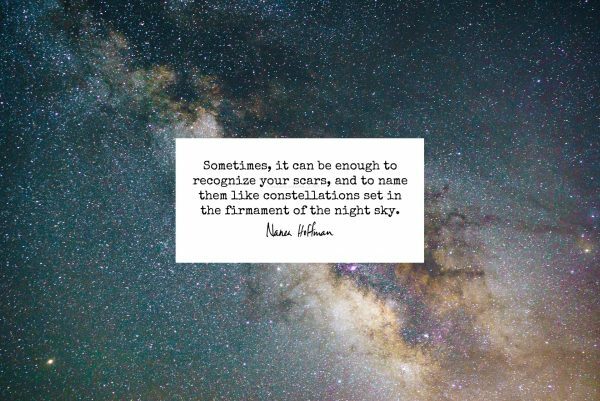 Sometimes, it can be enough to recognize your scars, and to name them like constellations set in the firmament of the night sky. It all rings so true. “it’s taken years to understand that I’m deeply and essentially angry that I was taught to distrust my own perceptions at an early age. And that most of my shame is about that anger.” This is at the crux of it, at the absolute ground zero of it for me. Thank you for putting the words in a conscious stream of thought. It’s a validation I’ve been needing. Thank you so much for an article about shame and family. I was raised by a single mother with a ton or pride, who couldn’t let go enough to raise her children. Now after living with her my sister is beginning to withhold emotionally too, and it kills me. The emotional and cognitive sharing helps me a lot. I have intense feelings of fragility and dissociation, spaciness, and I think it comes from emotions not getting addressed for a long time. This process of visiting my own pain through others and of the long stories of emotional insensitivity and uncaring and games gives me some awareness and self awareness back, from where it had been buried for my own self protection. I still live with one parent now, my father, and I need more peers, more talking about what has hurt me. My father insists for my own self respect that I am normal, but I am also hurt and fragile and emotionally have weaknesses, so going through my issues with your help is greatly appreciated and opens my eyes to my own thoughts and feelings.